Matt Housman was a Hanston kindergartener when he first watched Oliver Salmans play football. At that time, Housman didn’t like the sport. Housman’s best friend was Oliver’s much younger brother, Luke. The two were at an Elks’ football game, and Luke told Matt he knew someone in the contest. “Didn’t think there was any way anybody could actually know someone out there playing on the field, and it was Oliver, and he was having a great game,” Housman said. After the contest, Matt went up and shook Oliver’s hand, a life-changing moment. 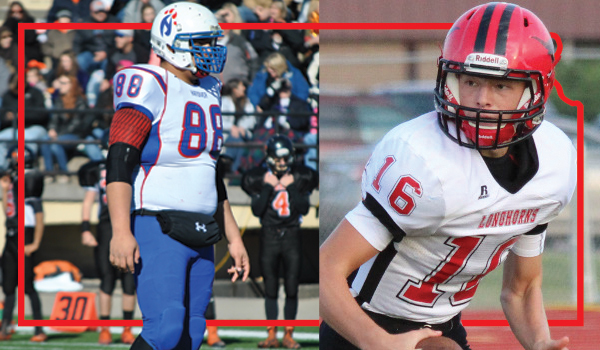 Oliver Salmans, a multi-sport standout, was an all-state and Top 11 player for Hanston and longtime coach Jerry Slaton, who captured a Kansas record, six state championships at the eight-man level. Housman went to Hanston and graduated in 2001. He played for Salmans, who started coaching back home in Housman’s eighth-grade year. Housman is now in his seventh season as head coach for Hodgeman County, the eventual consolidation of Hanston and Jetmore. Oliver is Housman’s veteran assistant coach. All three of Salmans’ sons – senior Jacob, sophomore Eli and freshman Isaac – play key roles for the 10-2 Longhorns. Jacob is a four-year starter at quarterback, while Eli is the starting running back. Issac filled in for Jacob when his brother was injured earlier in the year. The trio all are instrumental defensively. This Saturday, Hodgeman County, with a five-win improvement from 2016, will play 12-0 Hanover in the Eight-Man, Division II state championship at Newton’s Fischer Field. Game time is 3:30 p.m. The Wildcats lost the Division I title game in ’14-’15 and defeated Dighton, 68-22, for the Division II championship last fall. In the last two weeks, Hanover, with 28 players and depth across the board, pulled away in the second half to beat Caldwell (58-12) and previously unbeaten Pike Valley (36-24). Hanover leads Division II in scoring defense and is second in offense at 650-100 despite missing electrifying junior Thomas Atkins (nine total scores). Atkins is not expected to play Saturday. Senior lineman Carlos Emanuel, a Division I recruit and returning all-state pick at 6-foot-5, 305 pounds, paces with 76 tackles and 13.5 for loss. Junior Cade Cohorst has moved from the interior line out to end and has a team-high five interceptions. Sophomore Jonah Weber (6-4, 220) has emerged on the line. Heuer is 126-25 in his 13th season at his alma mater. He is 3-3 in state title games overall and 3-0 in Division II contests with victories also coming in ’08-09. Among active eight-man coaches, Heuer is tied for the most championships as a head coach with Victoria’s Doug Oberle, Northern Valley’s Chuck Fessenden, current Solomon coach Steve Tiernan, and current Wallace County coach Kevin Ayers, who won Jetmore’s only two state crowns in ’01 and ’03. Hanover graduated quarterback Will Bruna, the eight-man state record holder in multiple passing categories. Junior Daiken Stallbaumer has stepped in with 35 of 55 passing for 786 yards with a 13/1 TD/INT ratio. Last week, he finished 7 of 10 passing for 162 yards with a 2/1 TD/INT ratio. Hanover averages 10.2 yards per play compared to 9.1 last season. A big improvement comes in the running game with experienced backs Kevin Diederich and Carter Bruna. They’ve helped the Wildcats average 9.5 yards a carry after 6.9 in 2016. Diederich, a senior, has 54 carries for 769 yards and 19 scores. Bruna, a junior, is at 82 carries for 740 yards and 16 TDs. Stallbaumer has recorded 53 carries for 571 yards and 16 scores. Hodgeman County returns to the state game for the first time since 2013 when Osborne defeated the Longhorns, 56-8. The Salmans brothers served as team managers. In the last three years, Jacob helped the Longhorns to 7-2, 8-2 and 5-4 records. This season, Hodgeman County opened as the west favorite. The Longhorns fell to rival Spearville in Week 2, and then lost by 32 at Otis-Bison in Week 9 for the district title. Jacob and Eli were both banged up, and Otis-Bison controlled the game on the line. However, the Longhorns have gotten hot in the playoffs, including a 42-16 home victory versus Otis-Bison last week. The Longhorns led 36-0 in the third quarter. Hodgeman County has total margin of 558-213 and averages 7.8 yards per play. Last Friday, for the first time all year, Hodgeman County committed to a four-man front defensively. The offensive line showed marked improvement from Week 9. Jacob Salmans said the line has improved on “just finishing off their blocks.” Juniors Dellon Shelton and Ethan Eckhoff are key on both sides. Eli Salmans has 196 carries for 1,379 yards and 23 rushing scores. He was bothered by both ankles in Week 9. In the playoffs, he has a collective 55 carries for 440 yards and seven scores. He stands second with 105 tackles, while Isaac is third at 91. Hodgeman County lost 2016 leading tackler Luke Shiew to a career-ending neck injury after Week 1. Senior linebacker Treyton Coats has stepped in with 128 stops after 79 in his first three seasons. Senior Trevor Morgan, whom Housman (70-24 in his career) calls the best athlete he’s ever coached, leads with 34 catches for 561 yards and six scores. Jacob Salmans, one of the state’s most experienced quarterbacks regardless of class, has completed 62 of 107 passes for 980 yards with an 8/4 TD/INT ratio. He has 107 rushes for 614 yards and 14 scores. Long known for his efficiency, Salmans has completed 62 percent of his career passes for 5,022 yards with 64 scores against just 17 interceptions. He has rushed for 31 touchdowns. After Friday’s victory, Salmans first sprinted to the sideline and embraced his father. Then, he ran to the start of the line as Hodgeman County engaged in the postgame handshake with Otis-Bison.